Emergency officials searched for survivors Monday in the debris left by a powerful tornado that killed at least 14 people in Arkansas and carved an 80-mile path of destruction through suburban Little Rock. The tornado that slammed into Vilonia, just north of the state's capital city, grew to about half a mile wide Sunday and was among a rash of tornadoes and strong storms that rumbled across the Midwest and South. The National Weather Service warned that more tornadoes, damaging winds and very large hail would strike Monday in parts of Mississippi, Alabama, Tennessee and Louisiana. "We don't have a count on injuries or missing. We're trying to get a handle on the missing part," Arkansas Gov. Mike Beebe said at a news conference Monday. "Just looking at the damage, this may be one of the strongest we have seen." Brandon Morris, spokesman for the Arkansas Department of Emergency Management, said crews were sifting through the rubble in the hope of uncovering survivors and to assess the damage. "Right now, the main focus is life safety," Morris said. "We're trying to make sure everyone is accounted for." Karla Ault, a Vilonia High School volleyball coach, said she sheltered in the school gymnasium as the storm approached. After it passed, her husband told her their home was reduced to the slab on which it had sat. "I'm just kind of numb. It's just shock that you lost everything. You don't understand everything you have until you realize that all I've got now is just what I have on," Ault said. The tornado that hit Vilonia and nearby Mayflower would likely be rated as the nation's strongest to date this year, as it has the potential to be at least an EF3 storm, which has winds greater than 136 mph, National Weather Service meteorologist Jeff Hood said. "Based on some of the footage we've seen from Mayflower and where it crossed Interstate 40, things were wrecked in a very significant way," he said, adding that emergency officials were "making sure utilities are cut off in the area. We don't want anything to get, any fires to start or anything like that." In southeastern Iowa, a woman was killed when either a tornado or powerful straight-line winds caused a farm building to collapse. Another twister killed a person in Quapaw, Okla., before it crossed into Kansas, where it destroyed more than 100 homes and businesses, and injured 25 people in the city of Baxter Springs, according to Kansas authorities. 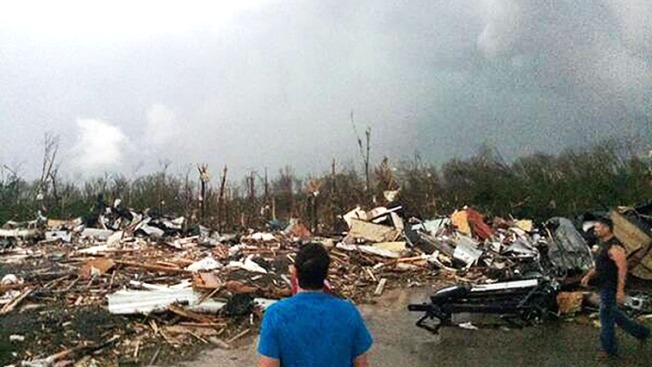 The overall death toll stood at 16 late Monday morning, 14 in Arkansas. Sue McBride, a 71-year old retired sewing machinist in Baxter Springs, said she thought the tornado sirens could spell a false alarm. But then she saw and heard the twister approaching. She said debris flew all around as she ran into her home. She hunkered on her knees in her hallway with her head down as the tornado shattered her windows, spraying glass all over her. "I didn't have one scratch on me and I was fine," McBride said from a Red Cross shelter in the city, where the tornado left a trail of shattered homes, twisted metal and hanging power lines. The Arkansas twister shredded cars, trucks and 18-wheelers stuck along Interstate 40 north of Little Rock. After the storm passed, tractor-trailer rigs tried to navigate through the damage as gawkers captured cellphone photos of the destruction. State troopers went vehicle-to-vehicle to check on motorists and found -- with genuine surprise -- that no one was killed. "About 30 vehicles -- large trucks, sedans, pickup trucks -- were going through there when the funnel cloud passed over," said Bill Sadler, a spokesman for the Arkansas State Police. Nearby Conway Regional Medical Center said it treated about 100 people injured in the storm. Among the ruins was a new $14 million intermediate school that had been set to open this fall. "There's just really nothing there anymore. We're probably going to have to start all over again," Vilonia Schools Superintendent Frank Mitchell said after surveying what was left of the building. Late Sunday, emergency workers and volunteers went door-to-door checking for victims and survivors. "It turned pitch black," said Mark Ausbrooks, who was at his parents' home in Mayflower when the storm arrived. "I ran and got pillows to put over our heads and ... all hell broke loose." "My parents' home, it's gone completely," he said. Becky Naylor, 57, of Mayflower, said up to 22 people "packed like sardines" into her storm cellar as the tornado approached. "People were pulling off the highways and were just running in," said Naylor. Men held the cellar doors tight to prevent the tornado from ripping them apart. "It sounded like a constant rolling, roaring sound," she said. "Trees were really bending and the light poles were actually shaking and moving. That's before we shut the door and we've only shut the door to the storm cellar two times." The other time was in 2011, during an EF2 tornado that followed nearly the same path and killed at least four people. "This storm was much stronger," Vilonia Mayor James Firestone told ABC's "Good Morning America" early Monday. "The devastation was just tremendous." The Arkansas Department of Emergency Management raised the Arkansas death toll to 16 early Monday -- eight adults and two children in Faulkner County, five people in Pulaski County and one in White County. At a news conference in the Philippines, President Barack Obama sent his condolences and promised the government would help. Sunday was the third anniversary of a 122-tornado day, which struck parts of Mississippi, Alabama, Tennessee, Virginia and Georgia and killed 316 people. Christina Huynh reported from Mayflower. Associated Press writers Jill Bleed and Kelly P. Kissel in Little Rock; Kristi Eaton and Tim Talley in Oklahoma City; and Roxana Hegeman in Baxter Springs, Kan., contributed to this report.